Jared and I use to play high school in baseball. While I was stuck on the JV team, Jared was playing first base and pitcher for the varsity club. Jared’s a lifelong baseball fan, so for the Halloween Honk and Wave this morning, he donned his baseball uniform and grabbed his glove (from high school no less!). We went to two locations, both prime intersections with lots of commuters. 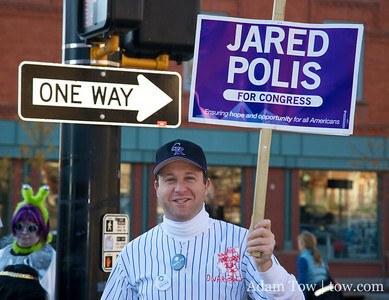 Staffers and volunteers for his campaign were there to honk and wave to the driving, biking, and walking commuters. From what I’ve learned, the hectic part of this campaign was the Primary. Jared’s victory against several other Democrats was hard-fought and well-deserved. The polls for the general election are very positive for Jared, so things are much calmer now than they were a couple of months ago. Click the link below to see photos from the honk and wave!